There’s truth in the saying that the way to a person’s heart is through his stomach. 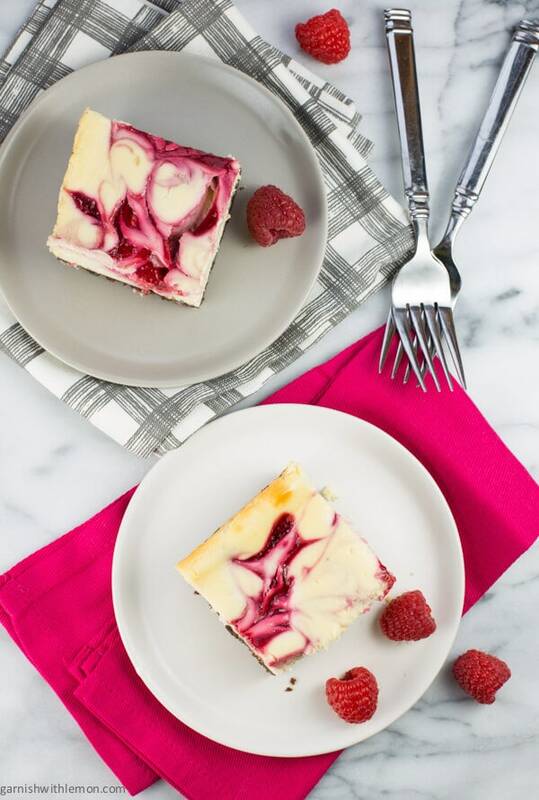 Raspberry White Chocolate Cheesecake Bars are the perfect way to make your valentine fall in love with you all over again. Valentine’s Day – the perfect opportunity to go the extra mile and show your friends and family how much you care. Who doesn’t love it when someone they love puts a little time into preparing something special? Cheesecake is a favorite dessert in our house, but a whole cheesecake can be a bit much for our family of four. 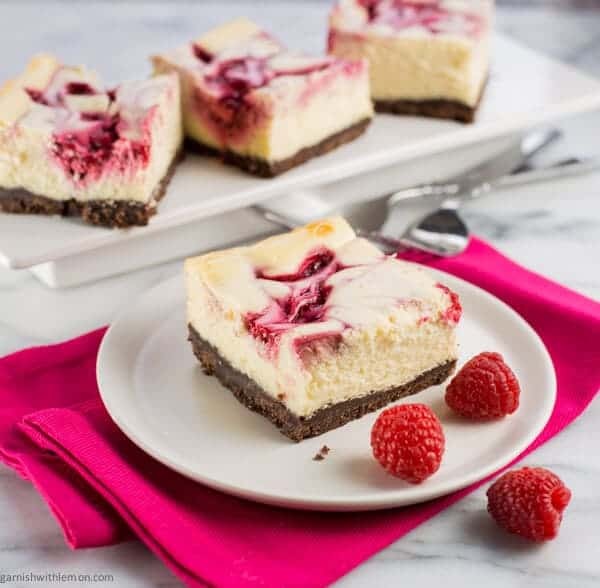 Making cheesecake in bar form takes care of that problem in a hurry, and you can’t help but feel special when one of these gorgeous Raspberry White Chocolate Cheesecake Bars is placed in front of you. The secret to making really great cheesecake? Room temperature cream cheese. Start with that, and you will be on your way to the silkiest cheesecake bars ever. Promise. Another tip? Take your time and beat the cream cheese until it’s light and fluffy. I beat mine in my stand mixer for a full 5 minutes. No cheating. Your patience needed is rewarded with smooth, silky cheesecake bars every single time. White chocolate is a perfect complement to the chocolate graham cracker crust and gives the cheesecake filling a hint of chocolate without overdoing it. 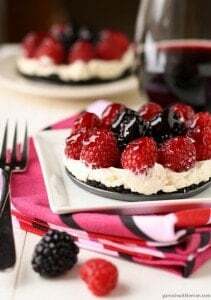 The fresh raspberry puree brightens the flavors and adds the perfect swirls of color to make a dessert that is sure to impress even the toughest critic. And while these Raspberry White Chocolate Cheesecake Bars are the perfect dessert for your Valentine dinner, they’re also great any time. Who wants to save such a delicious sweet treat for only once a year? Not me, that’s for sure. Preheat oven to 350 degrees. Line a 9 x 9 baking pan with foil and set aside. In a small bowl, combine chocolate graham cracker crumbs and sugar. Add melted butter and stir until moistened. Pour into prepared pan and press down with your hands to make an even layer. Bake for 6 minutes and let cool. Lower oven to 325 degrees. Combine raspberries and sugar in a blender and puree until smooth. If desired, pour raspberry puree through fine meshed strainer and discard seeds. Set aside. Place room temperature cream cheese in a stand mixer and beat for 5 minutes. Add sugar and mix until combined. Add eggs, one at a time, beating thoroughly after each one. Add flour and vanilla and mix well. Fold in white chocolate and pour mixture over cooled crust. 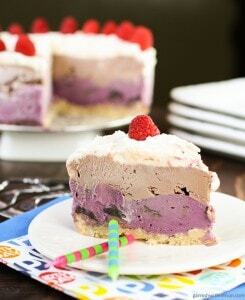 Add raspberry puree in tablespoons on top of cheesecake filling and use a toothpick to make swirls throughout the top. Bake for 45-55 minutes or until cheesecake bars are set. Remove from oven and cool. Chill for at least 2 hours before serving. 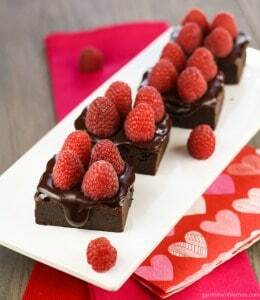 Cut into squares and garnish with fresh raspberries. I love white chocolate and raspberry together. Add in cheesecake and I am in heaven! Thanks for sharing. It’s beautiful! Very pretty raspberry swirls. And you’re right…why wait until Valentine’s Day to make this cheesecake? No good reason in my book 🙂 I’m thinking you should make them today! A whole cheesecake is too much in our house too, so this is perfect! And will have to try with room temperature cream cheese this time, thanks! Room temperature cream cheese makes a world of difference! I’ve been into raspberries lately so these are perfect for me. I haven’t decided what to make my family yet, but I agree that it is the perfect time to make a fantastic, homemade treat for them. These disappeared quickly in my house! Beautiful swirls! My husband loves cheesecake, loves white chocolate, and would go gaga over this if I used strawberries. 🙂 Sounds like a perfect dessert for Valentine’s! These are so gorgeous. I am seriously craving cheesecake now! OMG! Love! Those are the flavors I like!!! I love the way white chocolate and raspberry tastes together, so delicious, and I can only imagine how delicious these flavors would be in a cheesecake bar! Sounds incredible. Can’t go wrong with this flavor combo! Anything raspberry has a thumbs up in my book! These look delish! These look incredible! Love the raspberry swirl! Heaven!!!! One of my favorite flavor combinations when it comes to desserts is white chocolate and raspberry, so I’m pretty smitten with these pretties. I agree, I LOVE when people bake for me! Happy Valentine’s Day to you too! These look soooo good! Planning on serving these at a Baby Shower this weekend for my neice:) Can’t wait to make! Yes, just make sure to cool them completely before you freeze them! Enjoy! I want to make these but for more of a crowd. Do you think doubling the recipe and doing a 9×13 pan would work and what would baking time be adjusted by?